I’ve been trying a lot of new haircare products since I’ve dyed my hair a lot and the damage is becoming very apparent. I have been anemic for a while and hair loss is also a big concern. From my previous post, I mentioned purchasing a new brush, the Tangle Teezer, that helps with detangling and seems to be helping with not pulling out as much hair. In one of the Sephora hauls, I bought the Verb Hair To Go to try. It was a convenient sizes for trying their products; it came with a shampoo, conditioner, leave in mist and sea salt spray. The shampoo and conditioner was working very well for me at first. I used it for a little more than a week and the hair felt very salon quality. Unfortunately, the scalp area started to itch and there were some signs of dandruff. I had to stop using it mid way due to this reason and I probably won’t be purchasing the full size bottle. The leave in mist that it came with doesn’t seem as great as reviews had said; it didn’t have any major impacts that I could notice. I quite like the sea salt spray but since it’s my first time using this type of spray I really don’t have anything to compare it to. The smell of these products was very minimal and not very fragrant and floral like other shampoos which I like. Overall, the shampoo felt great for the hair but not my dry scalp so it was time to move on to other products. Since the Verb products left my scalp itchy and flaking, I tried to use a gentler shampoo. 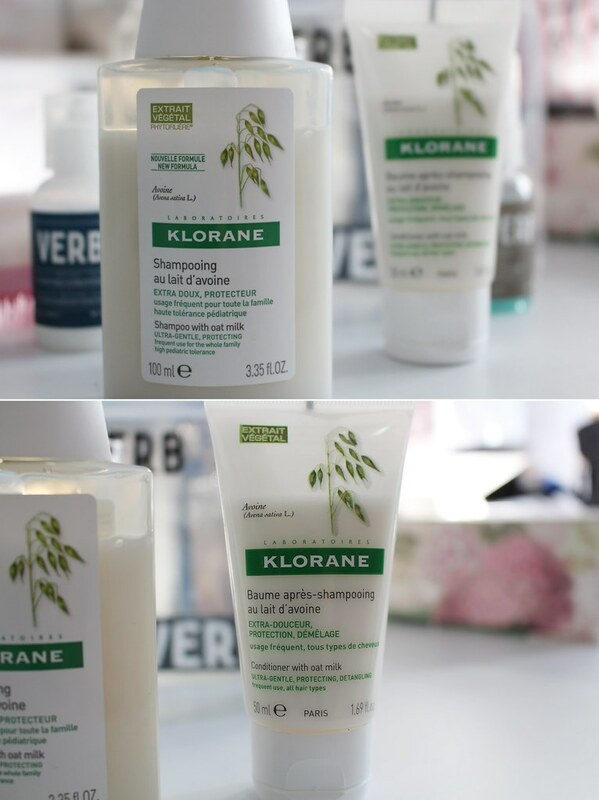 I found the Klorane shampoo with oat milk. Though it doesn’t really contain any oat milk at all or even smell like it, it does seem to be gentler on the scalp and after a little more than a week of use, my scalp isn’t as itchy. I bought the smallest size to try and just recently bought the conditioner in the same line as well. The shampoo doesn’t really foam up as much as what I’m used to. But as you can see from the pictures, I haven’t really used this product a whole lot so I don’t have a good conclusion on it. So far though I like that it seems gentler than other shampoos. I’m still in the market for other haircare products haha. What do you recommend? I love Klorane products. The hair brush sounds great Vicky. Tangle Teezer is best ❤ Love mine and have the smaller one in my travel bag as well! I am sorry to hear your experience with VERB! Klorane products are pretty good. I also like OGX hair products, and they are very affordable. Although the prices are a bit higher, Moroccan Oil and Aesop work really well. Hmm I’ve also been on the lookout for great haircare products, I recently bought something my local hairdresser recommended, with keratin. I think Keratin products make the hair much softer, and so far so good! Haha I’ve never tried anything with Keratin before but I would love to hear more about it! I’ve never heard of these brands before but I must try them out! I tried L’Occitane Repairing Shampoo once cos i had a sampling, or else it’s really a bit expensive to buy that shampoo itself. It gives my hair a better touch, softer, and felt really good. Or Ryo呂, the Korean brand? They have a diverse products for different kind of hair, perhaps you’ll want to try the hair dye damaging hair. I tried their shampoo for my hair, it’s nice. Or try shampoo with essential oil? Essential oil may sound very oily, cos that’s what I had in mind in the beginning as well, but it cleans both the scalp, and hair wonderfully. I do felt my hair was healthier using essential oil.